14/08/14 -- Soycomplex: Beans closed higher, save for the expiring and thinly traded Aug 14 which went off the board 40 cents lower. Aug 14 meal also posted a technical close. Weekly export sales came in at 61,400 MT of old crop and 1.08 MMT of new crop. Expectations were for a combined 850 TMT to 1.2 MMT. The new crop sales were primarily for China (640,000 MT), unknown destinations (293,500 MT), and Taiwan (115,000 MT). New crop bean sales are now said to be ahead of all previous marketing years. Aug 14 Soybeans closed at $12.24 1/2, down 40 cents; Nov 14 Soybeans closed at $10.56, up 9 1/4 cents; Aug 14 Soybean Meal closed at $464.20, up $45.50; Aug 14 Soybean Oil closed at 33.60, down 35 points. Corn: The corn market closed around 3-4 cents firmer. Weekly export sales came in at negative 117,100 MT on old crop and 787,800 MT for new crop. That was a bit below where they were expected to be (750 TMT to 1 MMT). Strategie Grains estimated the EU-28 corn crop at 68.0 MMT versus a previous estimate of 66.4 MMT. Germany's DRV forecast corn production there up 13.7% this year at close to 5 MMT despite a lower planted area due to significantly higher yields. MDA CropCast forecast the US 2014 corn crop at 14.43 billion bushels, down 14 million from a week ago. South Korea Kocopia bought 55,000 MT of optional origin corn for Dec shipment. Sep 14 Corn closed at $3.62, up 4 cents; Dec 14 Corn closed at $3.73 1/2, up 3 3/4 cents. Wheat: The wheat market closed higher, consolidating from a run of five losing sessions in a row, despite disappointing weekly export sales of only 338,700 MT versus the expected 450-650 TMT. Strategie Grains forecast the EU-28 soft wheat crop at 144.1 MMT, up 3.7 MMT from a month ago and 6% up versus 2013. MDA CropCast increased their forecast for the world wheat crop by 8.2 MMT from a week ago, including a 6.1 MMT hike for Russia where impressive yields continue to be reported. They also increased China by 2 MMT. Russia said that they'd harvested 61.1 MMT of grains so far this year. That includes 43.6 MMT of wheat off less than half the planned area. There's talk that some analysts are now estimating Russia’s wheat crop at 61-63 MMT versus the USDA's estimate of 59 MMT. Sep 14 CBOT Wheat closed at $5.37 1/4, up 9 1/4 cents; Sep 14 KCBT Wheat closed at $6.08, up 4 cents; Sep 14 MGEX Wheat closed at $6.05 3/4, up 1 1/4 cents. 14/08/14 -- EU grains trade mostly lower at midday, with Nov 14 London wheat down GBP0.35/tonne at GBP121.90/tonne, Nov 14 Paris wheat is EUR0.25/tonne easier at EUR171.00/tonne, Nov 14 Paris corn is down a euro at EUR153.00/tonne and Nov 14 Paris rapeseed is EUR1.75/tonne easier at EUR320.00/tonne. The old adages "big crops get bigger" and "rain makes grain" are being well used at the moment, and with good reason. The USDA are now forecasting record world wheat, corn and soybean production in 2014/15. The Russian grain crop isn't just ticking up either, if Tuesday's 6 MMT hike in wheat production and 2 MMT rise in barley output are anything to go by. The USDA now have this year's Russian wheat crop at 59 MMT, and are forecasting that the country will also produce 18.5 MMT of barley in 2014. The question now regarding Russia is "is that it, or are there more rises to come?" If we accept the bare numbers coming through from the Russian Ministry then it looks like these figures could still be too low. They say that the country's 2014 grain harvest now stands at 61.1 MMT off little more than 40% of the planned area, with yields currently averaging 3.19 MT/ha, which is 20% more than this time a year ago. Whilst the harvest is well advanced in the south and central areas, it is only just getting going in Siberia and the Urals. These are less productive regions, and will bring the national average yield figure down as the harvest progresses, but these areas should still be able to produce a 2 MT/ha average. Wheat accounts for 43.6 MMT of this year's Russian grain harvest so far, off 12.2 million hectares, according to Ministry estimates. The USDA estimate the Russian wheat harvested area at 23.75 million hectares this year. That leaves 11.55 million hectares still to harvest. If that area only produces a yield of 2 MT/ha then we'd potentially be looking at a Russian wheat crop of 66.7 MMT in bunker weight this year. That could be one of the reasons why Russian grain exports hit 3.12 MMT in July, a record for that particular month, and are seen rising to around 3.6 MMT in August. Switching back to Europe, French analysts Strategie Grains today hiked their forecast for the EU-28 soft wheat crop by 3.7 MMT from just a month ago due to better than anticipated yields which they described as being "exceptional in many countries". That takes production up to 144.1 MMT, a 6% rise on a year ago. With an anticipated durum wheat crop of a further 7.2 MMT to add to that, EU-28 all wheat production will now come in at 151.3 MMT this year if Strategie Grains are correct, which would beat the 2008 record year by around 200 TMT (although European data now includes Croatia). This is also significantly higher than the USDA's forecast of 147.9 MMT from just a few days ago. They did however caution on quality, cutting the percentage of the wheat crop rated as being suitable for milling down from the 67% forecast last month to 59%, and a sharp reduction on 71% this time last year. These problems are particularly manifest in France, for whom they cut projected wheat exports in 2014/15 by almost 3 MMT. The French Analysts also increased the size of the EU-28 barley crop by 1.4 MMT from last month to 57.7 MMT (versus 56.2 MMT from the USDA) and upped their corn estimate by 1.6 MMT to 68 MMT (versus 67 MMT from the USDA). Meanwhile Germany's farm co-operatives association DRV raised their estimate for the 2014 grain crop there to 50.1 MMT, versus 47.8 MMT last year and 45.6 MMT for the 5-year average. They also see OSR production rising this year from 5.8 MMT to 6.1 MMT. They estimated the German 2014 winter wheat crop at 26 MMT, up 5.4% on last year, with winter barley production rising 10% to 9.2 MMT, and corn output up 13.7% to nearly 5 MMT due to significantly higher yield potential. They said that the quality of this year's wheat crop was "average to good" although proteins are lower than last year. Elsewhere, the Czech Stats Office raised their estimate for the 2014 cereal crop there from 6.65 MMT to 7.06 MMT, up 3.5% on last year's 6.82 MMT and 4.4% above the 10-year average. Wheat will account for 4.74 MMT of that total, they said. 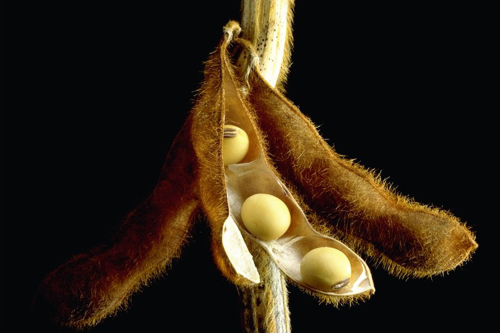 13/08/14 -- Soycomplex: Beans closed lower, as the trade digested yesterday's USDA numbers, amidst talk that their US yield estimate was too low and will likely increase in future reports. Next week's ProFarmer crop tour which kicks off on Aug 18 may shed some more light on the yield issue. CNGOIC estimated China’s 2013/14 soybean imports at 70 MMT versus the USDA's 69 MMT. They see 2014/15 soybean imports at 73.0 MMT, the same as the USDA said yesterday. They forecast China's August soybean imports at 6.2 MMT. The Argentine Ag Ministry said that farmers there had sold 52.14% of their 2013/14 bean crop versus 61.02% a year ago. The NOPA July crush report comes out on Friday. Estimates for that are around 115-116 million bushels. Before that we have the weekly export sales numbers from the USDA tomorrow. Bean sales are expected to come in at around 850 TMT to 1.2 MMT. Aug 14 Soybeans closed at $12.64 1/2, down 25 1/2 cents; Nov 14 Soybeans closed at $10.46 3/4, down 12 3/4 cents; Sep 14 Soybean Meal closed at $368.70, up $3.50; Aug 14 Soybean Oil closed at 33.95, down 67 points and another fresh 5-year closing low for a front month. Corn: The corn market closed narrowly mixed. The trade also expects that the USDA is too low with their US corn yield estimate this year, and that subsequent reports will come in higher, even though yesterday's 167.4 bu/acre would be a record. Demand remains pretty good at these levels though. The USDA announced 107,600 MT of US corn sold to Mexico for 2014/15 shipment,along with a further 130,000 MT to unknown. Weekly export sales tomorrow are expected to be in the region of 750 TMT to 1 MMT. Sales for 2014/15 are already close to 7.75 MMT. South Korea's FLC bought 60,000 MT of optional origin feed corn for Jan shipment. South Korea's Kocopia are tendering for 55,000 MT of optional origin corn for Dec shipment. US corn is currently said to be the most competitively priced origin into North Africa, cheaper even than Black Sea of Argentine corn. The Ukraine Ag Minister said that this year's grain crop could beat last season's record 63 MMT production (in bunker weight). That's probably a bit ambitious. UkrAgroConsult estimated this year's crop at 58.5 MMT in clean weight. The Argentine Ag Ministry said that farmers there had sold 61.87% of their 2013/14 corn crop versus 73.74% a year ago. Sep 14 Corn closed at $3.58, down 1/2 cent; Dec 14 Corn closed at $3.69 3/4, up 3/4 cent. Wheat: The wheat market closed lower once more. It's now been down for 5 sessions in a row. Yesterday's surprise 11 MMT hike in the size of the world crop to a record 716 MMT weighs on the market, especially when now coupled with a record global and US corn crop too. Russia and Ukraine accounted for 7 MMT of that increase, and large crops in that region is rarely bullish news for wheat prices. Russia's 2014/15 wheat exports look like outstripping those of last season by 4 MMT, according to the USDA, and last year's tonnage was enough to depress the market. The Australian Bureau of Meteorology said that heavy rain was forecast for the end of the week in QLD and NSW, which will be of significant benefit to wheat crops there. Australian Crop Forecaster Profarmer estimated this year's wheat crop at 24.86 MMT, up 1% from their previous estimate. The Rosario Grain Exchange increased their forecast for Argentine wheat plantings this year to 4.36 million hectares, a more than 16% rise on last year's 3.75 million. They said that 93% of this area is already sown. The Argentine Ag Ministry said that farmers there had only sold 65.62% of their 2013/14 wheat crop compared to 97.66% a year ago. US export sales tomorrow are expected to be around 450-650 TMT. Sep 14 CBOT Wheat closed at $5.28, down 10 cents; Sep 14 KCBT Wheat closed at $6.04, down 9 1/4 cents; Sep 14 MGEX Wheat closed at $6.04 1/2, down 4 1/2 cents. 13/08/14 -- EU grains closed mixed. London wheat was mostly a touch higher, recovering some of yesterday's losses that saw prices end close to recent 4-year lows. Paris wheat closed within less than a cent of the Jul 31 low, whilst London wheat finished only GBP0.25/tonne away from its Aug 1 low. The day ended with Nov 14 London wheat up GBP0.20/tonne at GBP122.25/tonne, Nov 14 Paris wheat was EUR0.75/tonne lower at EUR171.25/tonne, Nov 14 Paris corn was unchanged EUR154.00/tonne and Nov 14 Paris rapeseed was down EUR0.50/tonne to EUR321.75/tonne. In amongst the detail of last night's USDA report was an increase in the size of the the UK wheat crop, up from the 15.3 MMT forecast last month to 15.4 MMT, a 29.2% rise year-on-year. They forecast the UK barley crop at 5.9 MMT, unchanged from last month and 16.8% down versus 2013. They tweaked higher their estimate for the UK OSR crop, up from 2.53 MMT to 2.57 MMT, a 20.8% rise compared with last year. Whilst the forecast for the EU wheat crop was essentially unchanged at just under 148 MMT, exports were cut by 3 MMT due to the various quality issues being experienced around Europe. The EU barley crop was increased from the 55.9 MMT forecast in July to 56.2 MMT, and the OSR crop was also estimated a little higher at 22.65 MMT versus 22.4 MMT previously. Significant improvement in production potential in Russia and Ukraine was noted. Russia's wheat crop was increased a hefty 6 MMT to 59 MMT, enabling them to potentially export 22 MMT of wheat in 2014/15, a 4 MMT or 22% increase versus last season. Russia's 2014 barley production estimate was also raised by 2 MMT to 18.5 MMT, a 20% increase on a year ago. Their barley exports in 2014/15 were increased by 300 TMT to 3.8 MMT, a sharp 40.7% rise versus last year. Ukraine's wheat crop was increased by a more modest 1 MMT from last month to 22 MMT, only a small drop on 22.3 MMT last year. 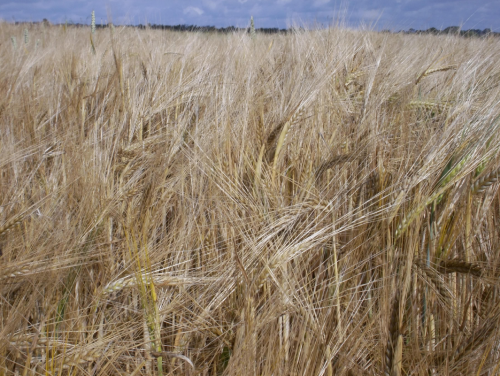 Barley output was increased from 7.8 MMT to 8.2 MMT, an 8.5% increase year-on-year. The EU corn crop was also forecast higher, seen benefiting from the recent rains that have disrupted the wheat harvest, at just over 67 MMT that represents an increase of almost 5% versus 12 months ago. Russia said that it had now harvested 60.2 MMT of grains off just over 40% of the planned area, including 43.4 MMT of wheat off 47.9% of plan. Wheat yields are said to be averaging 3.58 MT/ha versus 3.02 MT/ha a year ago. The USDA said last night that Russian wheat yields were "outstanding" - forecasting them to average 2.48 MT/ha, an 18% increase versus the 5-year average. You will notice that this figure is still well below the 3.58 MT/ha that the Russian Ministry themselves say is the average so far. Rusagrotrans said that Russia had exported 3.12 MMT of grains in July, a record for the first month of a marketing campaign, and 24% up on July 2013. UkrAgroConsult raised their forecast for the 2014 Ukraine grain crop from 57.4 MMT to 58.5 MMT in clean weight. They also increased Ukraine's 2014/15 grain export potential by 2.5% from last month to 32.5 MMT. Ukraine's grain exports so far this season (Jul 1 - Aug 11) were 3.03 MMT, a 48% increase on the same period in 2013/14. The desire to turn grain into dollars remains strong in Russia, and particularly Ukraine where the local currency - the hryvna - has lost a further 13% of it's value against the US dollar in the past fortnight and is down more than 37% since the turn of the year. Competition from both Ukraine and Russia looks like continuing to be pretty fierce for a while yet. Ukraine new crop corn prices are said to be down to around $183-184/tonne, less than GBP110/tonne FOB the Black Sea. 12/08/14 -- Soycomplex: Beans closed lower, with the new crop Nov 14 contract hitting lifetime lows following the release of the much anticipated USDA report. The reason that US soybean sales are holding up in the old crop essentially seems to be because last year's US production was underestimated. "In essence, USDA is saying last year’s crop production was understated by 94 million bushels or 1.3 bushels per acre nationally, which means the 13/14 yield was closer to 44.6 bu/acre than NASS’s 43.3 bu/acre," said Benson Quinn Commodities. The USDA increased 2014 US soybean yields from 45.2 bu/acre to 45.4 bu/acre, a record if achieved, although not quite as high as the 45.6 bu/acre that the market was expecting. That takes production this season up to a record 3.816 billion bushels, which is again not quite as high as the average trade guesstimate of 3.823 billion. Ending stocks in 2014/14 were pegged at a healthy 430 million bushels, up from the 415 million forecast last month, with the average farm price forecast trimmed from $9.50-11.50/bu to $9.35-11.35/bu. There were few changes elsewhere to the world supply and demand situation in 2014/15. Production potential in Brazil and Argentina was left unchanged at 91 MMT (record) and 54 MMT respectively. China's import needs were also unaltered at 73 MMT. Aug 14 Soybeans closed at $12.90, down 24 3/4 cents; Nov 14 Soybeans closed at $10.59 1/2, down 13 3/4 cents; Aug 14 Soybean Meal closed at $400.20, down $0.20; Aug 14 Soybean Oil closed at 34.62, down 26 points and another new 5-year low for a front month. Corn: The corn market closed with small gains after the USDA didn't raise 2014 US yields or production by as much as the market expected. Despite widespread expectations of a record 170+ bu/acre yield this year, the USDA only increased potential from 165.3 bu/acre to 167.4 bu/acre, which was around 2.6 bu/acre below the average trade guess. Production was therefore also below expectations of 14.253 billion bushels at 14.032 billion. Old crop ending stocks were expected to come in at 1.24 billion bushels, but the USDA put the actual number slightly lower at 1.181 billion. New crop carryout was estimated at 1.808 billion bushels versus the average trade guess of around 2 billion bushels this time round. Demand from the US ethanol sector was raised from 5.05 billion bushels to 5.075 billion. The average 2014/15 US farm price for corn was dropped 10 cents from last month to $3.55-4.25/bu. So although the USDA see a record 2014 corn crop and an ample stocks situation, supply is maybe not quite so weighty as the market expected. The question now though is will the USDA ultimately fall into line with many of the other yield estimates out there that are in excess of 170 bu/acre, or will they be proved right once the harvest begins? There was already some talk prior to today's report that they may come in on the low side on yields due to the fact that they traditionally base their estimates, at least partly, on historical averages. Some private analysts say that the benign growing conditions mean that corn ears this year are unusually large, possibly the largest ever. That might explain the reason that other analysts estimates are considerably higher than those from Washington. On the world stage the USDA put 2013/14 corn ending stocks at 171.09 MMT versus the average trade guess of 172.85 MMT, with 2014/15 carryout at 187.82 MMT versus the 192.53 MMT predicted. Sep 14 Corn closed at $3.58 1/2, up 1 3/4 cents; Dec 14 Corn closed at $3.69, up 3/4 cent. Wheat: The wheat market tanked as the USDA put US and world production higher than the trade expected. They estimated the US 2014 all wheat crop at 2.03 billion bushels versus the 1.99 billion forecast in July and the 2.01 billion that the trade anticipated. US 2014/15 ending stocks were increased from 660 million bushels to 663 million, which was exactly in line with pre-report estimates. US farm price expectations were cut from the $6.00-7.20/bu forecast a month ago to $5.80-6.80/bu. The market was surprised by a hike in global wheat production this year of almost 11 MMT to a record 716 MMT. That came due to a 6 MMT increase for Russia, a 2 MMT rise for China and 1 MMT extra from Ukraine. Russia's crop is now placed at 59 MMT this year, with their export potential increased from the 19.5 MMT forecast a month ago to 22.5 MMT, which is 4 MMT more than in 2013/14. US wheat exports in 2014/15 were increased slightly, from 24.49 MMT to 25.17 MMT. The EU-28's wheat export potential was cut by 3 MMT to 25 MMT due to the anticipated fall in quality this year. World 2014/15 ending stocks were estimated at almost 193 MMT versus trade forecasts of 190.4 MMT and the 189.5 MMT predicted a month ago. In other news the French Ministry raised their forecast for the domestic wheat crop from 36.5 MMT to 37.3 MMT. Ukraine said that they'd exported more than 3 MMT of grains so far this year, including 1.3 MMT each of wheat and barley. Russia said that it's 2014 wheat harvest was 47.5% complete, producing a crop of 43.2 MMT so far, with yields averaging 3.59 MT/ha, a 19% increase on a year ago. They've also harvested 10.1 MMT of barley off 37.7% of the planned area, with yields of 2.85 MT/ha representing a 27.2% rise versus last year. Algeria said that it might only have a 2014 grain harvest of around 3 MMT this year versus the 5-year average of 4.5 MMT. Sep 14 CBOT Wheat closed at $5.38, down 8 1/2 cents; Sep 14 KCBT Wheat closed at $6.13 1/4, down 10 1/2 cents; Sep 14 MGEX Wheat closed at $6.09, down 7 1/4 cents. 12/08/14 -- EU grains closed mostly lower, with London wheat ending the day within 5 pence of the recent 4-year closing low of GBP122/tonne. Paris wheat finished within sight of it's own recent 4-year lowest close of EUR170.50/tonne too. A close below long-term support at GBP120/tonne and EUR170/tonne respectively would signal more downside to come yet. At the close of play Nov 14 London wheat was down GBP1.15/tonne at GBP122.05/tonne, Nov 14 Paris wheat ended EUR0.25/tonne lower at EUR172.00/tonne, Nov 14 Paris corn fell EUR0.50/tonne at EUR154.00/tonne, whilst Nov 14 Paris rapeseed was down EUR2.50/tonne at EUR322.25/tonne. Rain makes grain is the old adage, even if it sometimes only makes for lots of low quality grain (just as it did here in 2008 when the harvest dragged on into October and we produced our highest wheat crop ever). The French Farm Ministry today increased their forecast for the 2014 domestic soft wheat crop from 36.5 MMT to 37.3 MMT, a 1.2% rise on last year. The Ministry also raised their outlook for this year's French barley crop from 11.3 MMT to 11.65 MMT, up 12.9% versus 2013, and increased their French OSR production estimate from 5.2 MMT to 5.5 MMT, a 26.6% hike on a year ago. In addition they forecast the French 2014 corn crop (their first estimate of the year) at 15.1 MMT, a 2.5% rise versus 2013 despite a fall in plantings, with yields up 8.1% to 9.07 MT/ha this year. Separately, FranceAgriMer largely concurred, estimating the 2014 French soft wheat crop at "above 37 MMT" versus an original forecast of 36.7 MMT a month ago. They estimated yields at 7.5 MT/ha, up 0.1 MT/ha on last year and 0.2 MT/ha above the 5-year average. They see barley production at 11.4 MMT this year, and agree with the Ministry's forecast of 5.5 MMT for the 2014 French OSR crop. Elsewhere the Romanian Ag Ministry raised their forecast for the 2014 corn crop there by 6.7% to 9.8 MMT. The Hungarian Ministry estimated corn production there at 8 MMT versus 6.73 MMT a year ago. Bulgaria said that it's rain delayed 2014 wheat harvest stood at 4.5 MMT off 89% of the planned area, and that despite the rain the barley harvest was almost over at 98.5% complete, producing a crop of just under 800 TMT to date. Customs data shows that the UK imported 225 TMT of wheat in June, a 9-month high, taking the 2013/14 seasonal total to 2.21 MMT.That's still historically high even if it is down versus the 2.96 MMT imported in the previous marketing year. Corn imports in June were 118 TMT, taking the 2013/14 total to 2.39 MMT, a 41.4% increase on the prior 12 months. Late in the day the USDA raised their forecast for the world 2014/15 wheat crop by almost 11 MMT to a record 716 MMT, taking ending stocks up from the 189.54 MMT estimated in July to almost 193 MMT. Production in Russia was hiked from 53 MMT to 59 MMT and Ukraine was raised from 21 MMT to 22 MMT. "The Russia and Ukraine increases are based on harvest reports that indicate very high winter wheat yields, especially for Russia," they said. In Europe they saw wheat production essentially unchanged, but increased feed usage from 54.4 MMT to 57 MMT as "excessive harvest-time precipitation in several European production regions has increased the quantity of feed-quality wheat." They increased the outlook for this year's EU-28 corn harvest from 65.64 to 67.05 MMT. 11/08/14 -- Soycomplex: Beans closed lower, save for the thinly traded, highly technical and about to expire Aug 14 contract. Weekly export inspections came in at 98,910 MT. The USDA reported the sale of 168 TMT of new crop beans to China. After the close they cut their 2014 US soybean good/excellent crop ratings by a point to 70%. They said that 72% of the crop is setting pods, up from 57% last week and the 5-year average of 65%. They said that 92% of the crop is blooming versus 85% a week ago and 91% for the 5-year average. All eyes are now on the USDA's August WASDE report due tomorrow. The trade is expecting US 2014 soybean yields to come in at a record 45.6 bu/acre versus their July estimate of 45.2 bu/acre. Soybean production is seen at an all time high 3.823 billion bushels versus the 3.8 billion estimated last month. 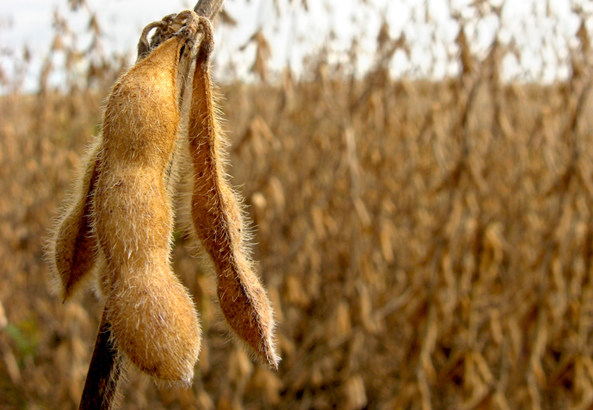 US old crop soybean ending stocks are seen being trimmed to 136 million bushels versus 140 million last month. US carryout in 2014/15 is expected to be little changed from the 415 million bushels forecast in July. World 2014/15 ending stocks are seen rising from the 85.3 MMT estimated in July to 85.9 MMT this time round. Separately, Celeres estimated that Brazil's 2014/15 soybean crop would rise 6% from this year's record 86.3 MMT to a new all-time high of 91.4 MMT. Aug 14 Soybeans closed at $13.14 3/4, up 30 cents; Nov 14 Soybeans closed at $10.73 1/4, down 11 1/2 cents; Aug 14 Soybean Meal closed at $400.40, up $2.90; Aug 14 Soybean Oil closed at 34.88, down 56 points and a fresh 5-year low for a front month. Corn: The corn market closed around 4-5 cents higher on what seems to have been short-covering ahead of tomorrow's USDA report. That is expected to provide a hike in 2014 US corn yields to a record 170 bu/acre (although many trade estimates are now above this level, few think that the USDA will increase things by more than 5 bu/acre in one go). Last month's estimate was 165.3 bu/acre. Production this year is seen coming in at a record 14.253 billion bushels, up from the 13.86 billion forecast in July and 2.4% up on last year. Old crop US corn ending stocks are forecast to be 1.24 billion bushels, down slightly on 1.246 billion a month ago. New crop inventories are seen rising from the 1.8 billion bushels estimated in July to around 2 billion bushels this time round. World 2013/14 ending stocks are forecast at 172.85 MMT, down slightly on 173.42 MMT a month ago. World carryout in 2014/15 is seen rising from the 188.05 MMT predicted in July to 192.53 MMT. After the close the USDA said that 73% of the US 2014 corn crop is in good to excellent condition, unchanged on last week. They said that 54% of the crop was as the dough stage versus 36% last week and 46% for the 5-year average. They said that 96% of the crop had silked, up from 90% a week ago and one point ahead of the 5-year average, and that 11% of the crop had dented. The latter figure is below the 5-year average of 16% and the first hint that crop development this year may have been a little retarded by the persistent cool Midwest conditions. Weekly export inspections came in at 905,137 MT. Israeli buyers are tendering for 120 TMT of option origin corn for Oct/Dec shipment. Sep 14 Corn closed at $3.56 3/4, up 5 cents; Dec 14 Corn closed at $3.68 1/4, up 4 3/4 cents. Wheat: The wheat market closed around 2-5 cents lower across the three exchanges. Weekly export inspections were respectable at 526,997 MT. Tomorrow's USDA report is likely to be more about corn and beans than it is for wheat, although we've said that before and been surprised. The 2014 US all wheat crop is expected to be marked slightly higher than last month's 1.99 billion bushels to around 2.01 billion. Spring wheat production is expected to contribute 579 million of that, up from 565 million a month ago. US 2014/15 wheat ending stocks are seen at 663 million bushels, up marginally from 660 million a month ago. World 2013/14 wheat ending stocks are estimated at 184.25 MMT versus 184.29 MMT a month ago. World 2014/15 carryout is seen at 190.41 MMT, up from the 189.54 MMT estimated in July. The US 2014 winter wheat harvest was estimated at 95% complete, up 5 points from a week ago and a similar figure up on the 5-year average. South Dakota is the only state where the harvest is behind normal at 75% complete versus 88% normally at this time. Spring wheat crop conditions were left unchanged at 70% good to excellent. 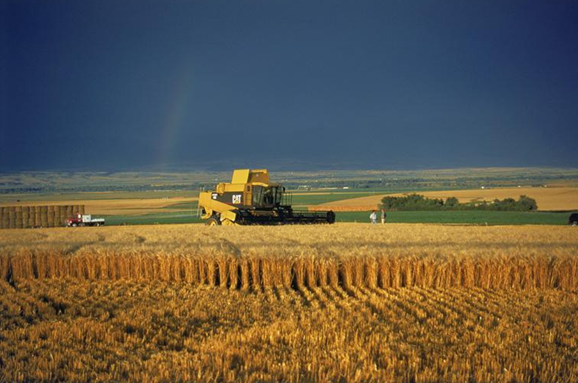 The fledgling 2014 spring wheat harvest is 6% complete versus the 5-year average of 21% done. The Dakotas are laggards again, with SD 11% done versus 55% normally and ND yet to start compared with a 5-year average of 18% complete on average at this time. Israeli buyers are tendering for 25 TMT of optional origin feed wheat for Oct/Nov shipment. Russian or Ukraine origin material looks the most likely to win that. The Russian grain harvest is now said to stand at 58.8 MMT off 18.2 million hectares, or just over 39% of the planned area. Sep 14 CBOT Wheat closed at $5.46 1/2, down 2 3/4 cents; Sep 14 KCBT Wheat closed at $6.23 3/4, down 5 1/2 cents; Sep 14 MGEX Wheat closed at $6.16 1/4, down 2 1/2 cents. 11/08/14 -- EU grains closed mostly lower to start the week, consolidating ahead of tomorrow's world supply and demand report from the USDA. The day ended with new crop Nov 14 London wheat closing GBP0.60/tonne lower at GBP123.20/tonne, Nov 14 Paris wheat was EUR2.00/tonne easier at EUR172.25/tonne, Nov 14 Paris corn was unchanged at EUR154.50/tonne and Nov 14 Paris rapeseed fell EUR3.25/tonne EUR324.75/tonne. The market was perhaps relieved that tensions between Russia and the West didn't deteriorate further over the weekend. The USDA could add a little bit more bearish news to the pot tomorrow, with an increase in US corn production and yields to record levels seeming highly likely. There could also be a tweak higher to EU wheat output, and maybe one for corn as well. Russian wheat production should certainly be in for an increase, as last month's 53 MMT estimate is now around 5 MMT below where some local analysts are lining up. The last figures out from the Russian Ministry said that the 2014 grain harvest there had now been completed on 16.9 million hectares, which is 36.2% of plan, producing a crop of 55.8 MMT so far. Yields were reported to be averaging 3.3 MT/ha, up almost 20% on a year ago. Wheat accounts for 41.4 MMT of that total off 45.4% of the intended area, with yields said to be up 18.8% at 3.6 MT/ha. As you can see from that, a final harvest of only 53 MMT looks way to low even if the Russian figures are in bunker weight (uncleaned) and allowing for lower yields from spring wheat in less productive areas like Siberia. Ukraine's Ministry said that they'd already exported 2.7 MMT of grain so far in 2014/15 (the season began on Jul 1), including 1.2 MMT of barley, 1.1 MMT of wheat and 361 TMT of corn. Kazakhstan said that they expected to export 8-9 MMT of grain in 2014/15, a similar volume to last season, out of an anticipated harvest of 17 MMT. Egypt said that it will maintain the price it pays the country's farmers for wheat through to the 2015 harvest, despite the fact that these levels are now over $100/tonne above world prices, in an effort to boost national production. It may also boost smuggling as $100/tonne is a big carrot to dangle. Agritel said that they estimated French wheat yields at 7.57 MT/ha this year, a 2.3% rise on 12 months ago, although recent rains mean that quality is highly variable. They estimate production at very close to the record levels of 1998. They said that French milling wheat prices delivered to Rouen (on the basis of 76 kg/hl, 220 hagberg and 11% protein) were around EUR177/tonne (circa GBP141.50/tonne), with French new crop rapeseed FOB Moselle offered at around EUR326/tonne (circa GBP260/tonne). 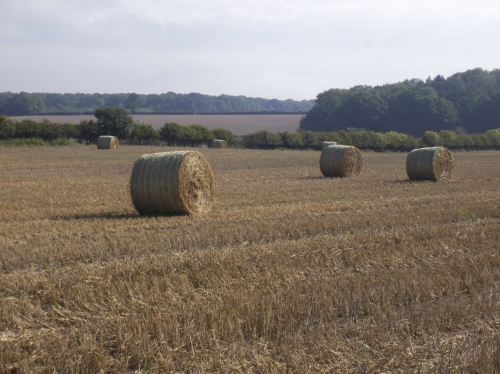 The HGCA reported last week that the 2014 UK harvest was one of the earliest in recent years. There might not be a great deal of further progress this week as Bertha brings cool and wet conditions for much of the country (and parts of the rest Europe too). Things look drier, brighter and warmer though around 10 days from now.